Here's a two-page spread of the new Spirit Book. 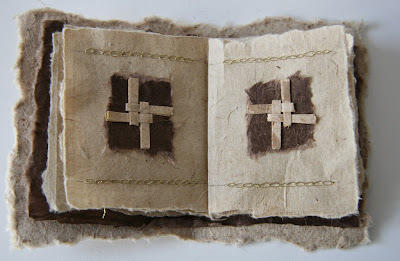 The St. Brigid's cross is made from Yucatan paper (natural patched) from Hiromi Paper. It is mounted on Lokta paper from Nepal from Paper Connection International. The pages are made from Tasho Natural paper from Bhutan from New York Central. love the layers and foldings Susan!